If you plan to visit Naples, Italy in mid-September, be sure to book your hotel well in advance. September 19th is the annual Feast Day of San Gennaro, the most important religious festival in Naples, Italy, and it draws huge crowds of both locals and visitors. A San Gennaro festival is also held in September outside of Italy in many Italian American communities outside Italy, including New York and Los Angeles and other cities across the United States. San Gennaro, the Bishop of Benevento and martyr who was persecuted for being a Christian and finally beheaded in 305 AD, is the patron saint of Naples. Inside the Cathedral or Duomo, the Chapel of the Treasure of San Gennaro is decorated with Baroque frescoes and other artworks. Most importantly it holds the saint's relics, including two sealed vials of his coagulated blood housed in a silver reliquary. According to legend, some of his blood was collected by a woman who took it to Naples, where it liquefied eight days later. On the morning of September 19, thousands of people fill the Naples Cathedral and Piazza del Duomo, the square in front of it, hoping to see the saint's blood liquefy in what's known as the miracle of San Gennaro. 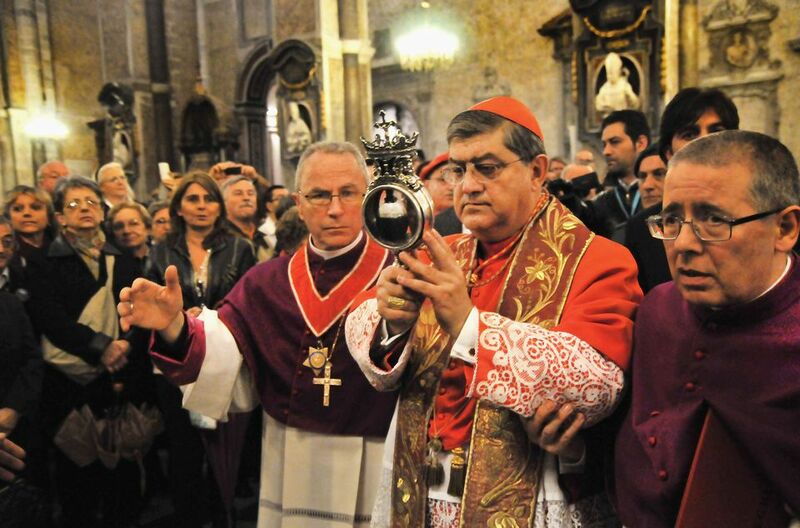 In a solemn religious ceremony, the Cardinal removes the vials of blood from the chapel, and takes them in a procession, along with a bust of San Gennaro, to the cathedral's high altar. The crowd watches anxiously to see if the blood miraculously liquefies, believed to be a sign that San Gennaro has blessed the city. It is thought to be a bad omen if it doesn't. If the blood liquefies–which it usually does–the church bells ring, and the Cardinal takes the liquefied blood through the cathedral and out into the square so everyone can see it. Then he returns the reliquary to the altar where the vials remain on display for eight days. As with many Italian festivals, there's much more than just the main event. After the ceremony, a religious procession winds through the streets of the historic center, where the roads and the shops are closed. Stands selling toys, trinkets, food, and candy are set up in the streets. Festivities go on for eight days until the reliquary returns to its place. The miracle of San Gennaro's blood is also performed on December 16 and the Saturday before the first Sunday in May, as well as special times during the year to ward off disasters, such as an eruption of Mount Vesuvius, or for visiting dignitaries, including Popes. Pope Francis visited the church in 2015, and the blood supposedly "half-liquefied" for him. While the Catholic Church does not take an official stance of the verity of the miracle, scientists contend that the glass vials of dried blood also contain a special gel that liquifies when moved. Whatever the case may be, the miracle of the liquefied blood has been recorded since the late 1300s, when the cult of San Gennaro began to take hold. For faithful Neopolitans, the miracle is a sign that San Gennaro loves the city and its people, and will protect them. It's typical for women to spend the day and night before the festival in the church, praying to the saint and urging him (and his blood) to perform his miracle the next day. Even if you don't believe in saints or miracles, the devotion with which everyday Neopolitans regard San Gennaro and his relics are moving and profound.